The audiovisual Guide to 40 angling waters in the Irish Republic. Everything you need to know about fishing in the Blue Stacks. 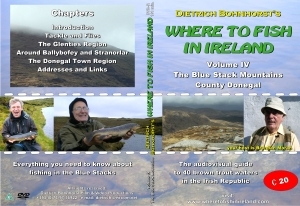 Where to Fish in Ireland is a practical step by step procedure explaining everything from fishing licences, the correct line and fly to use, to detailed descriptions of how to access the best lakes and rivers in The Blue Stack Mountains, County Donegal.